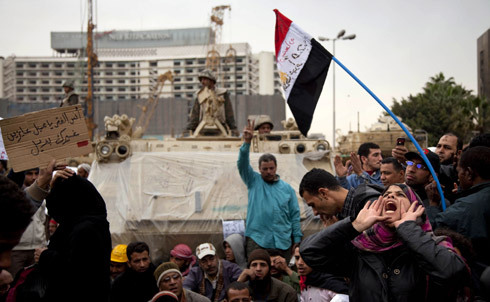 The first images of Egyptians flooding Cairo’s Tahrir Square this January captivated people around the world, long before anyone knew the protesters would actually topple their government. Scenes from the Arab Spring have become icons of a rare achievement—peaceful, successful revolution—so it is no surprise they are also being heralded as contemporary art. 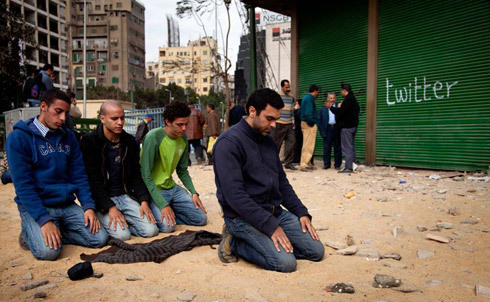 Nadav Neuhaus, a 39-year-old photographer who had traveled extensively in Egypt before the revolution, was able to return and capture the scenes leading up to President Mubarak’s resignation. Neuhaus’s photography focuses on newsworthy events, yet he also highlights the human scale, capturing images that might be missed in the daily news cycle. "Nadav’s work makes one feel that they are right there in the moment," explains Casey Kelbaugh, the founder of Slideluck Potshow, who co-curated a recent show on "upheaval" featuring Neuhaus. Conflict photographers and artists, Kelbaugh says, tell stories that the world might otherwise not hear. The Nation’s Ari Melber interviewed Neuhaus about several of the photographs from his recent show here in New York. 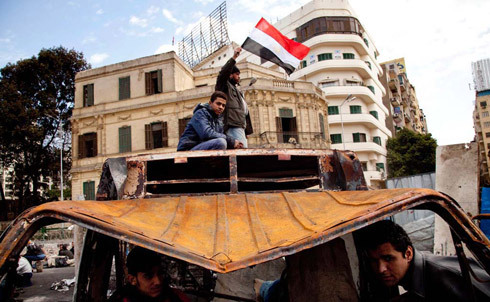 "Every year, there is a period of time when unions or the Communist party has an uprising," Neuhaus recalled, and at first many observers of Egypt expected another small, symbolic event. After a few days, it was clear this was different. "It was more than a political revolution," Neuhaus added, "it was a state of mind." Neuhaus had a vivid memory of this protester: "He looked like such a gentle person, in a day with a lot of violence." 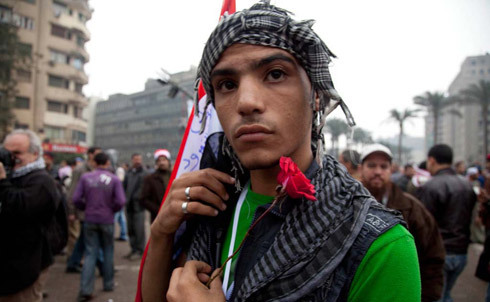 At one point, Neuhaus said, flowers were quite common in Tahrir Square, because Egyptians would come and hand out flowers and bread to encourage people to endure. "You couldn’t be hungry there, everyone was helping everyone," Neuhaus told The Nation. "Amazing energy there—I never saw a revolution like that." 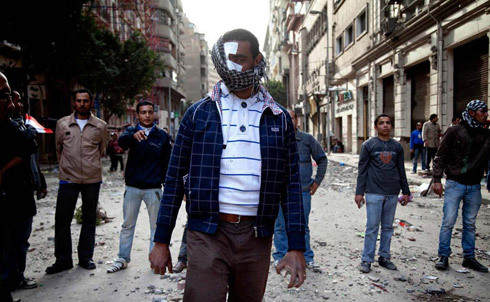 This protester was helping guard barricades against pro-Mubarak gangs, despite being injured in the demonstrations. "He was just standing there," Neuhaus recalled, "so I took the picture." 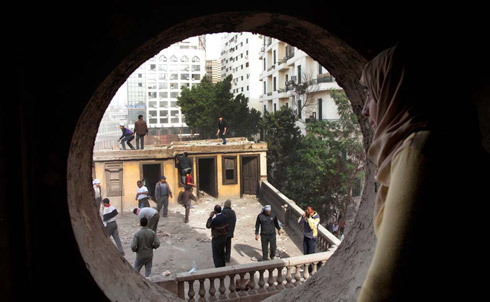 "I went up to one of the roofs to see where they were throwing stones," Neuhaus recalled, "and then I saw this girl looking through this circle over the stairways, and looking at all that is happening. The feeling of this one person—usually we look at revolutions as a movement, but it’s made up of individuals," he stressed. "In this moment, it was this kind of thing—she’s not really involved, she’s not shouting, but she’s Egyptian; she’s part of it." 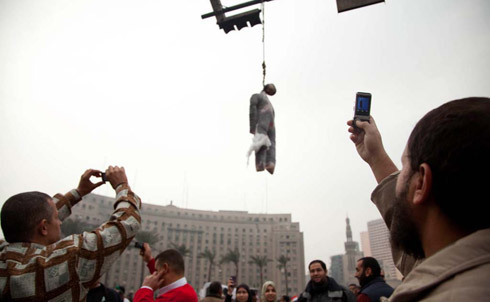 "Everybody had a mobile phone out [during the protests]," Neuhaus recounted—he believes the grassroots distribution of protest photos helped "change the world." Even as foreign photographers documented Egyptians in the streets, however, many were actually afraid of being photographed by Egyptians. "We were afraid the police would get the photos," Neuhaus explained. Asked whether this picture was posed, Neuhaus said he actually noticed the scene during a break. "I was just sitting on the ground and drinking tea, and I turned my head and this is what I saw—a group of young men praying and behind them, Twitter." Protesters celebrated Twitter and Facebook with graffiti and signs, Neuhaus said, because the tools were associated with organizing the first demonstrations. But they were not the heart of the effort. "Facebook didn’t cause the revolution—the people did," Neuhaus emphasized. 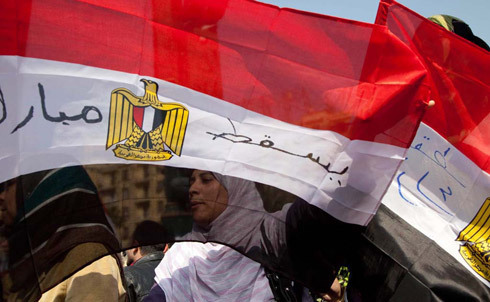 Neuhaus recalled talking to one of the women marching with these flags: "She told me, ‘We hate Mubarak, game over!’ It was such a modern way to put things." For more images from images from Egypt, visit Neuhaus’s website. For more images of “upheaval,” visit Slideluck Potshow’s website. For more from The Nation‘s Ari Melber, read his latest posts and articles on TheNation.com.